Matching hat and mittens also available in my store. 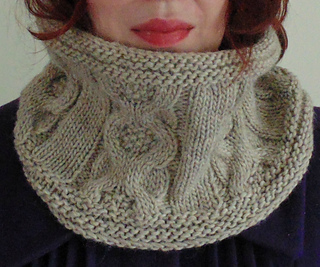 A cosy cowl featuring large decorative cable bezels which pop out like knit jewels! Knit in the round in one piece from the bottom up, the design is perfect for those new to cabling or a quick make for more experienced knitters. 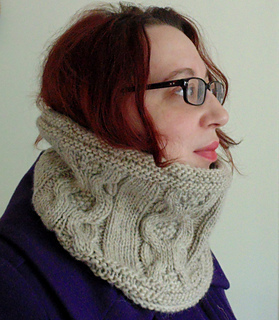 The cowl is relaxed yet close fitting. The design works best in yarns with high wool content. Resizing tips for modifying the circumference to make a looser or tighter size are included. 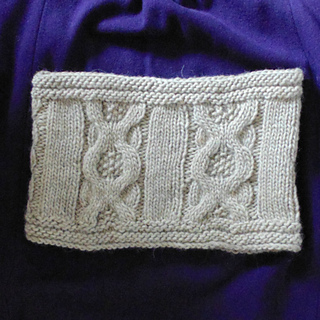 The cable pattern is both written and charted so you can work from whichever instructions you prefer. An additional chart key for left-hand mirror knitters is also included.